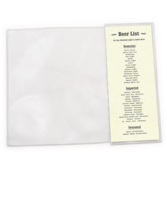 Two part sleeve with slip-In pockets for sewn edge or leatherette menu covers. Clear vinyl pocket is attached to tab with hinged joint. Tab fits into menu pocket, add-on pocket is exposed and will fold back and forth to expose both sides for double sided viewing. 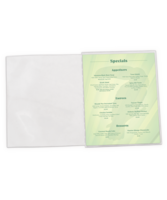 Clear Edges Slip-In pockets for sewn edge or leatherette menu covers. 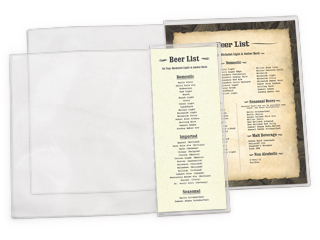 Shop online with the Menu Shoppe today.